Before we set off we cleared the shelves of all of the boxes of Decaf Ty-phoo from our local pound land, at £1 for 80 bags this is a bargain only 1.25 pence per bag. We are using a Bodum teapot which gives us 4 cups of tea from one tea-bag, that’s 0.3p per cup!! The teapot can also be used to hold tea leaves. There are many leaves which can be used from the garden e.g Melissa officinalis (Lemon Balm) is pretty prolific and can even be foraged for, as can fresh mint to make tea or Pimms! 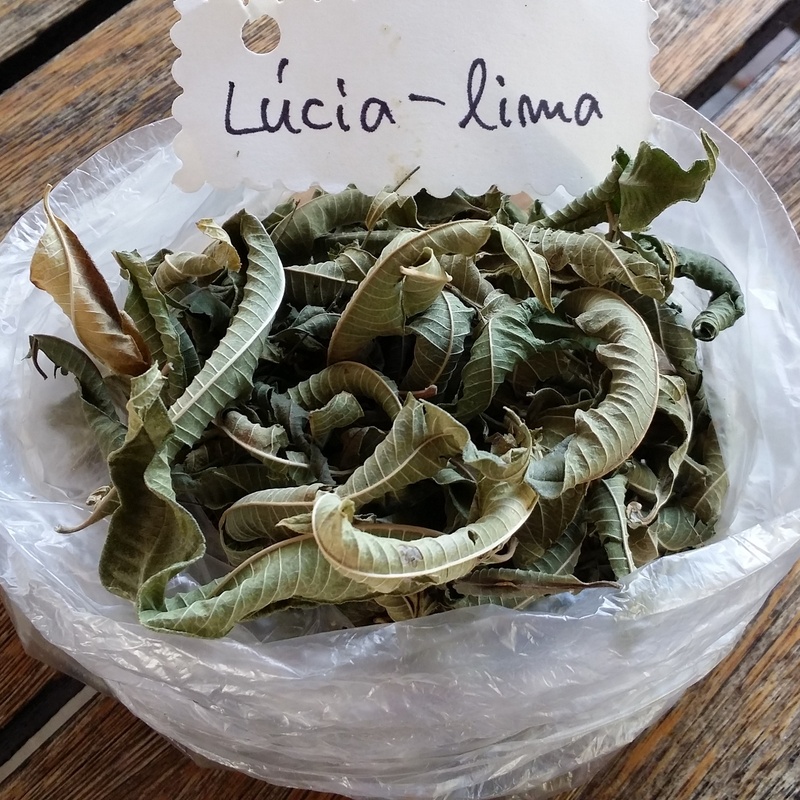 Our favourite is the soothing Aloysia citrodora (Lemon verbena/ lucia lima), amazing to be able to grow your own tea. These leaves are also available from the local Portuguese markets, a bag costing only €1. Five leaves per pot should do, cheap as chips, very natural and so many health benefits, much better than caffeinated tea from the supermarket! During November the olives are ready to pick. A net was placed on the grass to catch any falling olives whilst a ladder is used to prune the tree. Once a branch is cut down the olives can be easily picked off and dropped onto the net. The thicker branches can then be trimmed and used for firewood and the leaves pilled up and fed to the goats. When the tree is pruned the net of olives can be scooped up into buckets, the buckets poured into large sacks. By combining with the neighbour, we totalled nine sacks at thirty kilos per sack, there are several olive press’ available to take the olives to. The press will take their cut of the oil, which still left fifty litres of the good stuff. Read our post here about harvesting our own olives in Spain. Into a large mixing bowl stir together 170g/6oz self-raising wholemeal flour, 170g/6oz plain flour,½ tsp salt and ½ tsp bicarbonate of soda. Make a well in the centre and pour in 290ml/½ pint buttermilk, mixing quickly with a large fork to form a soft dough. Add more milk or flour as the dough should not be too sticky or wet. (The buttermilk is acidic so it reacts with the bicarb acting as a leavening agent). Turn onto a lightly floured surface and knead briefly. Shape into a round and flatten the dough slightly before placing on a lightly floured baking sheet. Cut a cross on the top and bake for about 30 minutes or until the loaf sounds hollow when tapped. Leave your lovely loaf to cool. Rinse fruits. Put them in a pan and cover with cold water almost completely. Heat and cook for over low heat, the berries will lose their shape and become mushy. Pass the mushy fruit through a cheesecloth or fine net, squeeze well to catch any juice. Weigh the juice, (I sometimes had 500- 1000g). Mix the juice with its equal weight of sugar. ((I tried using less sugar, which was still delicious but trickier to cook)). Simmer over low heat, skimming any foam which forms on the top at times. Check the consistency, cooking is complete when the hot juice is thick enough to form small beads. Let it cool down before placing in sterilised jars. Enjoy on toast the next morning! Freshly squeezed juice. The oranges were on the trees, ready to pick from November through to April. 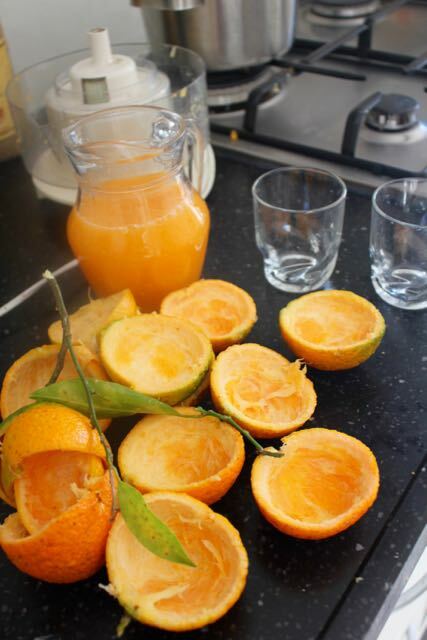 The large nobly Seville oranges were out of the question, too bitter, the naval oranges on the other hand were so good, depending on their size I would pick and squeeze up to twenty each morning for a jug full of fresh juice, nothing added. 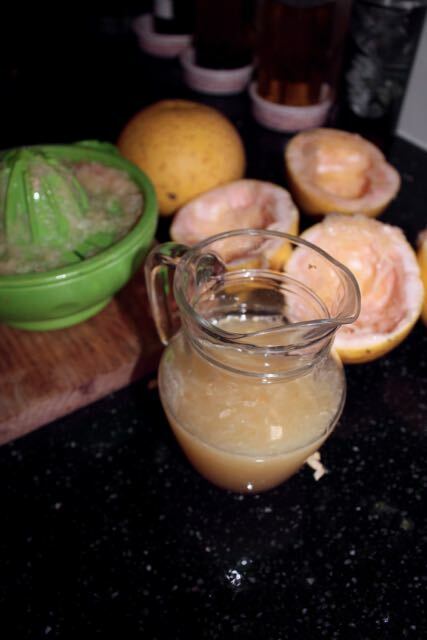 The grapefruits were available from a small tree in the front garden in December and Jan, an acquired taste, but I love it. My mum was over on her surprise birthday visit, she loved the tart juice too. Another fruit ready in November, perfect around christmas time is the pomegranate. There were two large trees, spiky trees! full of pomegranates. Ranging in size, some of the fruits were bursting open on the tree, revealing their ruby-red jewel like seeds. Pomegranate seeds freeze really well, we kept a couple of large bags full of frozen seeds, great to add to smoothies, salads or to blend and sieve for juice. 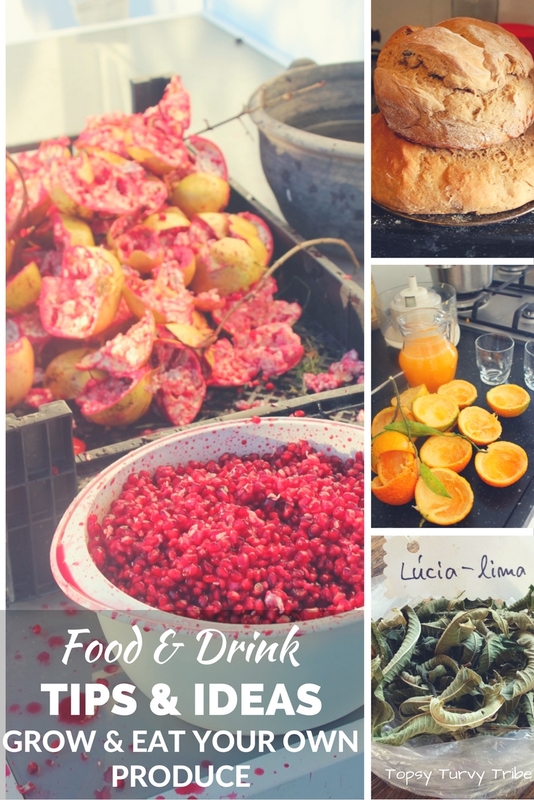 Pomegranate Juice: Simply slice in half, hold in one hand and hit them on the back to remove the seeds over a bowl, some of the seeds will burst but the juice will land in the bowl. 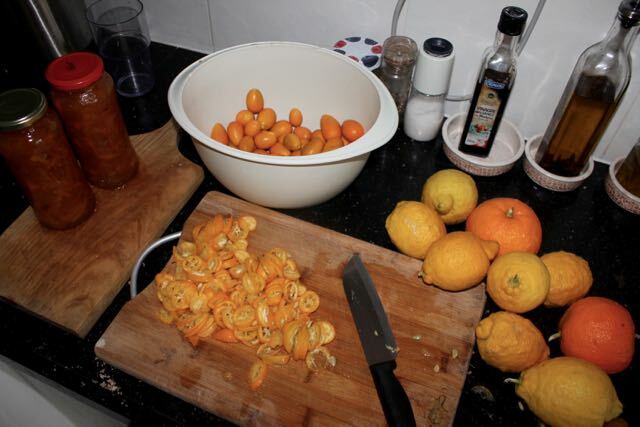 (Maybe do this outside, ha ha) Pick out any pith which may have landed in the bowl. Place the seeds and juice from the bowl into a blender, once blended pour through a fine net/ sieve/ muslin for pure, super healthy pomegranate juice or dilute with water to taste. Ha ha, thanks for commenting. You know what they say about pennies making pounds and all that…! The soda bead is delicious and easy to make! Pomegranate juice is a very strong taste but we love it and is so good for you! Thanks for commenting Catie!